Easily grown in dry to medium, well-drained soil in full sun to light shade. Best in full sun. Tolerant of drought and poor soils. Plants may self-seed in optimum growing conditions. Can slowly spread over time to form large colonies. Phlox bifida, commonly called sand phlox, is a mat-forming phlox that grows to only 6” tall, and spreads by trailing or spreading stems and self-seeding. Native from Michigan to Iowa south to Kentucky, Arkansas and Oklahoma. It is somewhat uncommon in Missouri where it typically grows in upland woods, ravine slopes and bluff ledges in dry, rocky soils of limestone, chert or granite (Steyermark). 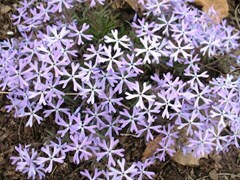 This creeping phlox features 5-lobed, pale blue to almost white flowers with tubular corollas. Blooms in spring (May). Each flower petal (corolla lobe) has a deep notch (to 1/8” long). Small, linear, lance-shaped, bright green leaves (to 2” long). The genus name is derived from the Greek word phlox meaning flame in reference to the intense flower colors of some varieties. Specific epithet means cleft into two parts. Although many species of phlox are susceptible to powdery mildew and root rot, this native species of phlox is noted for having excellent resistance to both problems if sited in a proper location. Sand phlox is an excellent spring-blooming phlox for the rock garden, perennial border, cottage garden, wildflower meadow or native plant garden.